I were sat in the local gym, chugging away at endurance cycling which is about all I can do while awaiting surgery. I generally dream about being anywhere else but sat on the damn bike. I often feel I should be looking for colorectal proctologist in preparation for the day I’ll need help to remove the horrible seat from my backside. On this occasion I happened to look out the window and spot a big yellow van stopped at the traffic lights. Initially it were the bright yellow and red flash of the Woodpecker which caught my eye. 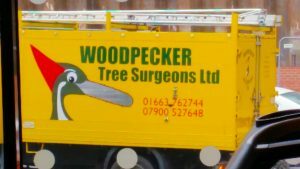 When I read the name “Woodpecker Tree Surgeons“, I thought that’s cool a wood carving bird aka a woodpecker for a tree surgeon comaony. As I looked closer I noticed the chainsaw beak and which made me smile. I took a quick photo through the window, and caught part of a treadmill too. I should point out, I Have NO Connection to this company at all, I mere saw it and thought that’s the kinda branding which sticks and be a good blog post. I had a quick google of other companies who use “Woodpecker” in their name, and the majority of them use a generic woodpecker image of some description or a silhouette style image. The custom image here perfectly describes what they do and matches their company name, making it so much more memorable. Its a shame they didn’t have a website on the side of the van, it would be far easier to remember rather than just a few phone numbers. Just FYI, Their website is exactly what they are called… WoodpeckerTreeSurgeons.co.uk. I’d say this company has NAILED the branding, matching name, funky graphics and very memorable.